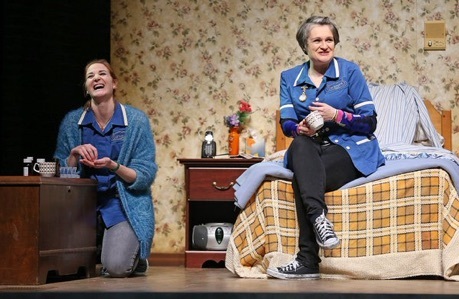 Fly Me to the Moon by Northern Irish playwright is an hilarious comedy where greed and conscience battle in the minds of two underpaid home-care workers in Belfast. Jones is best known for her world-wide hit Stones in His Pockets (1996) about an American film company visiting a small Irish town. That was written for two men who each play a wide range of characters. Fly Me to the Moon was written in part to help create good roles for middle-aged female actors, and that goal Jones has certainly accomplished with panache. The two actors may not have to play multiple roles as do the men in Stones, but the roles Jones has written are multifaceted and rich in humour. Francis Shields (Deidre Gillard-Rowlings), a Protestant, and Loretta Mackie (Carmen Grant), a Catholic, have been providing care for 84-year-old Davy McGee for years. The stroke-victim, a lover of playing the horses and Frank Sinatra, lives in a small dingy apartment designed with a keen eye for detail by Sue LePage, who places an alleyway on either side of the cutaway bedroom both to show the man’s isolation and to indicate the low-rent area he lives in. One day, Loretta is late for her appointment and Francis has had to move Davy into the loo on her own. Once Loretta arrives, Francis praises her son Jason for his entrepreneurship in selling all the latest films on DVD, sometimes even before they are released. She just doesn’t see why his high school didn’t recognize his business acumen and expelled him for petty crime. Earning only £6 an hour with both husbands laid off because of the recession, neither woman has the money to attend a hen party one of their friends has planned for Barcelona. Loretta doesn’t even have enough for her daughter’s school trip. As they chatter away tidying up Davy’s drab bedroom, they start to wonder why he hasn’t called for them to help him back to bed. He hasn’t done so because he’s dead. Immediately they’re flustered with all the matters they have to take care of now, like picking up Davy’s pension for £120 at the ATM. But a light clicks on inside the head of the mother of the entrepreneurial Jason. What if they were to collect Davy’s pension as usual and keep it for themselves? Who would know? Davy has no next of kin, and the government would just take it whereas they could both make good use of it. This is the first step on a slippery slope. When Loretta returns with the money feeling like a criminal, they discover in cleaning out Davy’s things that he bought the winning ticket at the races with a payout of £500. Unclaimed, the money will revert to the bookie, so why not claim on Davy’s behalf since no one but they know he is dead? From this point on Francis and Loretta work themselves up into a frenzied cycle of guilt, recrimination and self-justification until they convince themselves that by not having reported Davy’s death immediately they may be suspected of murder. The play is a carefully constructed crescendo of comedy as the women’s imagination of what they have done, what they have to do to conceal it and what they have to do if they are found out grows increasingly out of proportion. The action occurs over several hours on the same day. Jones has Francis and Loretta address the audience directly to narrate what has happened between scenes along with wry comments on their situation. These periodic interruptions help vary the tone of the play and help us to see what these two characters are like when they are not under duress. The play otherwise has very much the excited feeling of a farce, except that there are only two characters and there is no door slamming. All the opportunities and obstacles in the play are what the two imagine. Given that the subject is death and the fairly unpleasant chores that care-workers do to keep an aged person clean and neat, there is much black humour and mention of duties one would rather not think about except that they are realistically part of their job. Yet, even here Jones moderates the tone so that the show ends on a unexpectedly melancholy note. The two women discover a box under Davy’s bed containing various precious items from his life and come to realize that they have never really known anything about the man they have dressed, fed, and cleaned up after for so long. 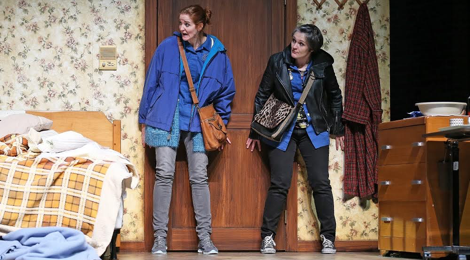 Political and social comment are not Jones’s primary goals, but the play does ask how it is that society has such disregard for the aged and infirm. Gillard-Rowlings and Grant are well paired and give absolutely delightful performances. From the serious roles they have been assigned at the Stratford Festival, one would never know how adept they both are at comedy, but this play shows just how perfectly attuned to it they are. Their interactions with each other are so natural that you almost forget they are not improvising the dialogue. Both have command of the Belfast dialect, which initially takes some getting used to, but if you just relax and accept the oddly (for us) distorted vowel sounds, you will come to love the tang it gives every phrase. Gillard-Rowlings is absolutely right as Francis, the cannier, more devious of the two with her phrase “Hear me out” becoming a dreaded introduction of yet another scheme. She is also a master of physical comedy in the priceless yet cringe-inducing scene where she tries to determine whether Davy, who has only one good arm, leg and eye, could actually have got himself into his wheelchair and into the loo. Grant is absolutely right as Loretta, the more fearful, more conscientious of the two, who nevertheless has reserves of strength that are deeper than Francis’s. Her escalating worries are funny in themselves but as she becomes more accustomed to her life’s new turn toward crime, she has her own “Hear me out” moment near the end. Krista Jackson paces the action very tightly so that there is almost not enough time to finish laughing before the next laugh begins. The one question I have about the play is what happens just before the two say their very last words. Loretta and Francis have a desperate plan of action but make a discovery that ought to alter that plan. It doesn’t seem logical that they would proceed with their plan given the new information they’ve found. Since there is no clear dialogue about it, it would be good know whether this action is inherent in the script or not. This point aside, Fly Me to the Moon is a boisterous, laugh-out-loud comedy that serves, as intended, as a wonderful showcase for the talents of two fine female actors. Photos: (from top) Carmen Grant and Deidre Gillard-Rowlings; Carmen Grant and Deidre Gillard-Rowlings. ©2016 Claus Andersen.